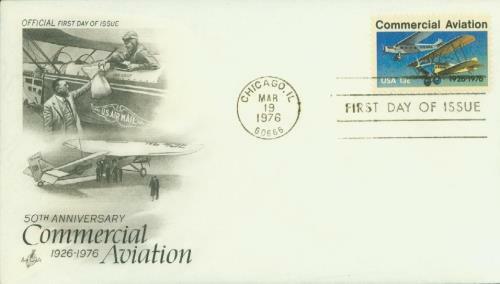 US #1684 was issued for the 50th anniversary of the first contract airmail flight. On February 15, 1926, the first contract airmail flight was made between Michigan and Ohio. American airmail service officially began in 1918. A handful of adventurous young aviators – some who had established themselves as “Flying Aces” during World War I – were eager for the opportunity to fly again, no matter what the circumstances. 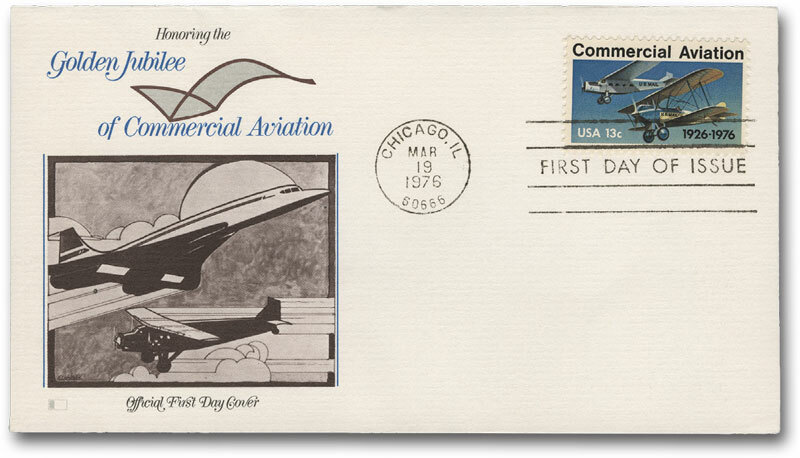 US #1684 – Classic First Day Cover. The pilots had to prove to a doubtful country that airmail service could be successful, and beyond their own ingenuity and daring, they had little to work with. Their fragile planes had few instruments, and those often failed to function. Pilots learned to rely instead on the “iron compass” – railroad tracks. When low visibility prevented them from spotting known landmarks and obstacles, these daredevil aviators developed some rather thrilling procedures to get them through… “After you cross the railroad tracks pull up into the soup, count to thirty, then let down – that way you’ll miss the high tension lines.” What a flight plan! US #1684 – Fleetwood First Day Cover. Until 1925, airmail deliveries were almost entirely carried on government-owned planes by pilots who were employed by the US Postal Service. But the government never intended to stay in the flying business. It was only necessary during the initial stage of establishing safe, economical, and dependable airmail service. That goal was achieved largely because there were men willing to risk their lives flying untried routes in unproven planes. US #C7 was issued for airmail flown up to 1,000 miles. By 1925, airmail service was considered a success. The mail got through often enough to satisfy most customers. The aviation industry was developing rapidly, and there were growing numbers of privately owned companies eager to carry the mail on their own planes. Legislation authorizing the Postmaster General to contract with such companies was passed in February 1925 and Contract Air Mail (CAM) Service came into being. 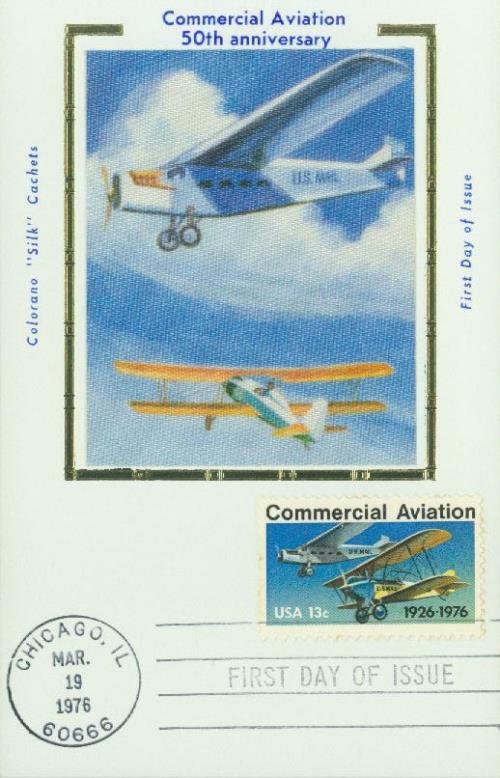 US #C8 was issued for airmail flown over 1,000 miles. That Act of Congress also set the rate of airmail matter on a contract basis – at a rate of 10¢ per ounce up to 1,000 miles. The first flight took place just two days after #C7 was issued. On February 15, 1926, the first flight left Dearborn, Michigan, for Cleveland, Ohio. The second flight occurred on April 6, 1926, on a route from Pasco, Washington, to Elko, Nevada. 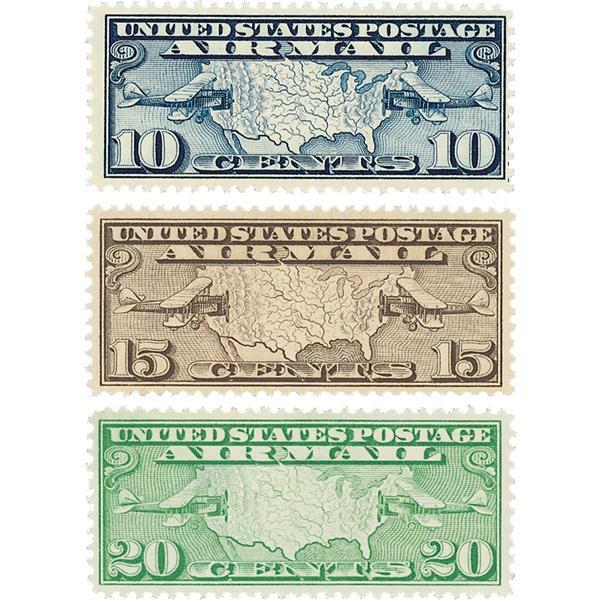 US #C7-9 were the first stamps issued for contract airmail flights. Once the industry opened up, contracts were assigned route numbers and let out to carry the mail. Ford Motor Company was the first contractor ready to fly mail. The expansion of the contract airmail system was slow. 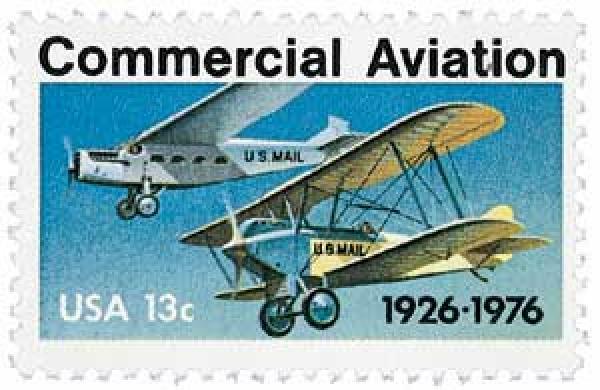 More than six months passed before it became necessary to issue the 15¢ stamp (#C8) to pay for airmail flown over 1,000 miles. The rates were a complicated system that varied depending on weight and the number of zones the mail had to cross. Effective in February of 1927, a simplified rate of 10¢ per half ounce was applied regardless of distance. US #1684 – Silk Cachet First Day Cover. In the 1930s, an airmail scandal erupted when Postmaster General Walter Folger Brown held an exclusive conference in which several larger airlines split up the airmail route. This prevented smaller airlines from bidding and led to a Senate investigation. President Franklin Roosevelt temporarily halted all existing contracts and turned airmail delivery over to the Army Air Corps. In 1934, Congress passed a new airmail act prohibiting conferences like the one that started the scandal. This led to a restructuring of the airline industry, technological improvements, and a much greater emphasis on passenger operations. By 1976, commercial flight was the principal means of inter-city passenger travel.